Anybody that knows me knows I am the first person to suggest a trip to Fancie. I love it. Not only do they make incredible cupcakes, in the last few months they have also started doing Breakfast, Lunch and Dinner at their Ecclesall Road store. The breakfast in itself is amazing - Pancakes, Eggs Benedict *mouth drooling*. Breakfast is my favourite meal of the day so I'm naturally quite passionate about it. Breakfast is only served until 12 though so make sure you late risers get your bums out of bed early and head down! A weekend breakfast/brunch trip may be in order! Come on guys, this has got to tempt you! Founder Amanda started Fancie back in 2007, on a much smaller scale than we are lucky enough to have now, got to start somewhere haven't you! Amanda had previous experience as a Chef and started out baking lovely little treats for friends, family and co-workers. Her first store opened on Sharrowvale Road and four years on the Fancie brand is very established in Sheffield with four shops and a almost-open bakery next to the Ecclesall Road store. 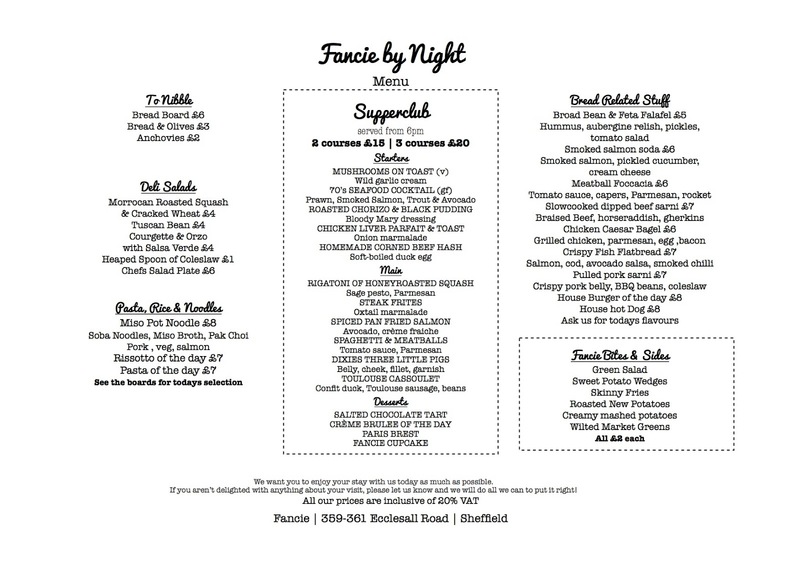 Fancie is now a very big deal to the residents of Sheffield and it's visitors, even having the likes of Jess Ennis and Shayne Ward regularly frequenting for a cupcake! 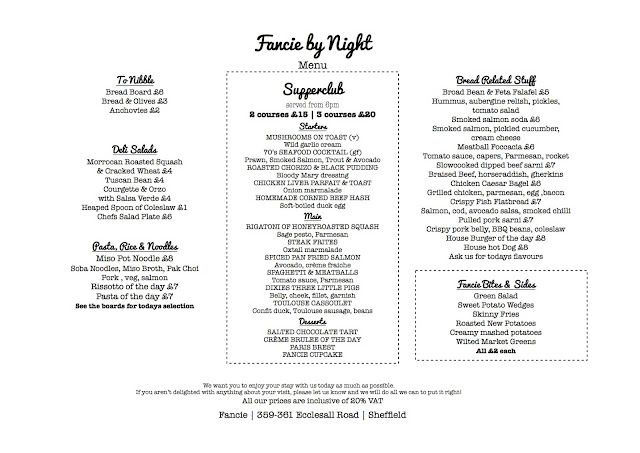 The Corned Beef Hash and Fried Duck Egg is next on my 'must try' list - it sounds like a dream, doesn't it? No..just me? The first trip to Supperclub didn't go quite as smoothly as we'd hoped; none of us knew what to pick. We were overwhelmed by the choice and how nice everything sounded. We decided we definitely wanted to try the Supperclub menu as it tends to change every couple of weeks, which is perfect for somebody like me because it encourages me to try something I might not necessarily make at home as I can only have it for a limited time. I decided on olives to start - cannot get enough of the little devils, they are just so good. For main I had Goats Cheese and Pumpkin Patilla with Bulgar Wheat and Tomato Tagine, some of the must-eat Sweet Potato wedges and a generous helping of Caramelised Onion Chutney. I like anything with Goats Cheese in. I could quite happily eat it for every meal, no joke! I decided on a Chicken Caesar Bagel, the most beautiful Raspberry Lemonade and a White Chocolate and Pistachio Macaroon...and some of those cheeky Sweet Potato wedges to go with my main of course. The four of us shared a bread board to start which came with homemade Hummus, Caramelised Onion Chutney (I had to ask for two pots, one is not enough!). Emily had the Asparagus and Pea Risotto from the special board (Oh yeah, they do a special board - everyday a special Risotto, Pasta, Burger, random special dish etc.) Kay had the Pulled Pork Sarni which looked fantastic and Jess had the Slowcooked Beef Sarni. I think we ate that much last time it put us off having the enormous three course meal. 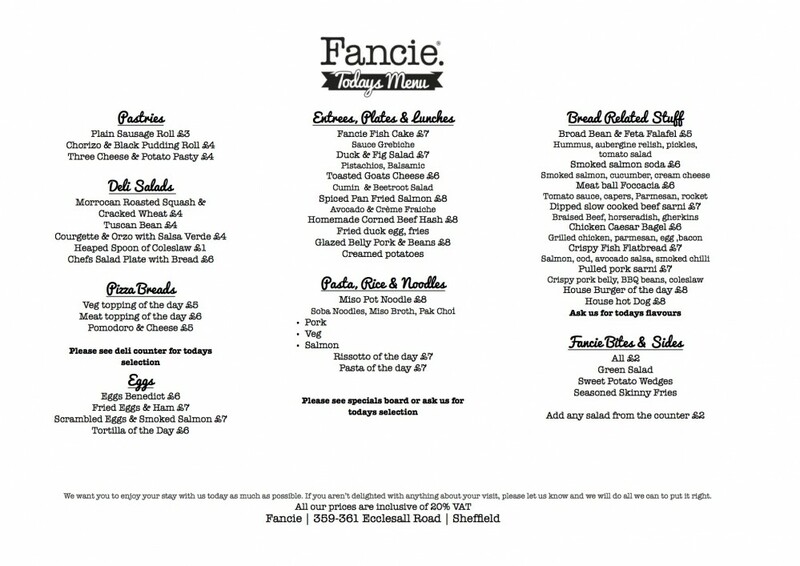 I would genuinely recommend to anybody living in Sheffield/visiting/passing through, to give Fancie a try. In four years, the founder has managed to open 4 shops and their new bakery is opening soon - that really says something, doesn't it? They now even give the option of online ordering/delivery! A girl that loves tea and cake gets things done. Check them out online (and place a cheeky order if you don't live in the North!) or on Twitter, or even on Facebook.